Those soaking up the sun one of the many beaches around Rhodes may also be interested to take time out and learn more about the island, at one of the many museums located here. 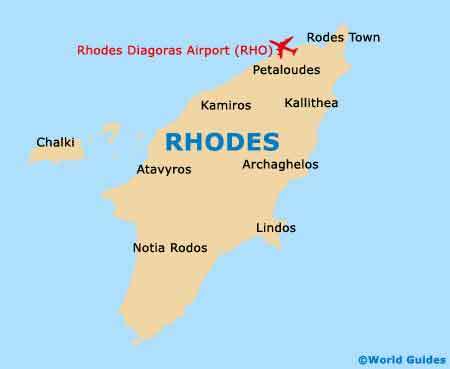 The main museums tend to be based within Rhodes Town itself, and so are close to the action and easy to find, with inexpensive tickets often providing a combined admittance at several of these attractions. 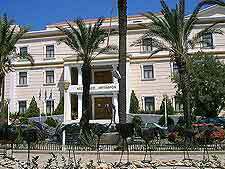 One of the very first buildings that you are likely to encounter once you enter the medieval city of Rhodes through the imposing Freedom Gate, sited on a prominent part of Symi Square, the Municipal Art Gallery is hard to miss and stands as one of the island's leading art galleries. Located within the old 'Knights' Hospital', a historical building dating as far back as the 15th century, the Archaeological Museum is especially famous on the island for its exhibits. Of particular interest is a Parian marble statue which goes by the name of the 'Aphrodite of Rhodes' and is more then 2,000 years of age. Slightly older and displayed in the adjoining room is the 'Afroditi Thalassia', which was created in the 4th century BC. The inner courtyard of the Archaeological Museum is surrounded by a very impressive colonnade, which spans two floors. The Museum of the Decorative Arts is to be found within a building that once served as the Knight's arsenal and is home to an extensive array of Dodecanese artefacts and treasures. These include many old and hard-carved wooden vessels, along with pottery, folk costumes and some very well-preserved embroideries, from the 17th century onwards. The Rhodes Modern Art Museum is definitely one gallery not to overlook and contains a priceless collection of 20th-century Greek Art. On display are a variety of contemporary sculptures in various mediums, along with some colourful paintings and drawings by acclaimed Greek artists of their time. The Modern Art Museum is to be found in the very centre of the Medieval Town area and along the Sokratous Street. Each year, the art-related MoTer festival is hosted at the gallery and always draws large crowds. 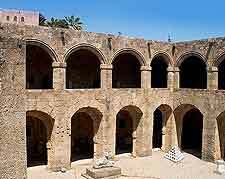 Founded towards the end of the 18th century, the Muslim Library may well be of interest to many tourists sightseeing around Rhodes. 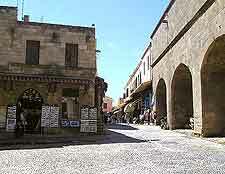 The library itself was created at the request of Ahmed Hasuf, a local Rhodian originating from Turkey. Step inside the library and you will discover a large and interesting collection of both Arabic and Presian scripts, along with some historic handwritten Korans. A fairly extensive collection of Greek paintings from around the 20th century is on display at the Municipal Art Gallery, and although only around 100 exhibits are available for viewing at any one time, the museum's collection is actually much larger and does get changed around on occasion. Especially noteworthy are the pieces by Greek artists such as Bouzianis, Kontoglou, Moralis and Spyropoulos, amongst many others.